Contemporary music has always been the way in which individuals can express what they feel or think towards somebody or something. That's why this season, GidiXmas brings to the city that never sleeps, the best of contemporary music from a host of talented musicians. Satisfy the crave for good music with a night of Afrobeat, jazz, Soul, Broadway, traditional and Christmas carols in Lagos style! The concert features the 2015 Muson jazz festival headliner; Girls Rule Band (an all-female band) Afro jazz guitarist Femileye, Muson Jazz concert headliner 2014 Imoleayo Balogun, and performances by young music scholars. 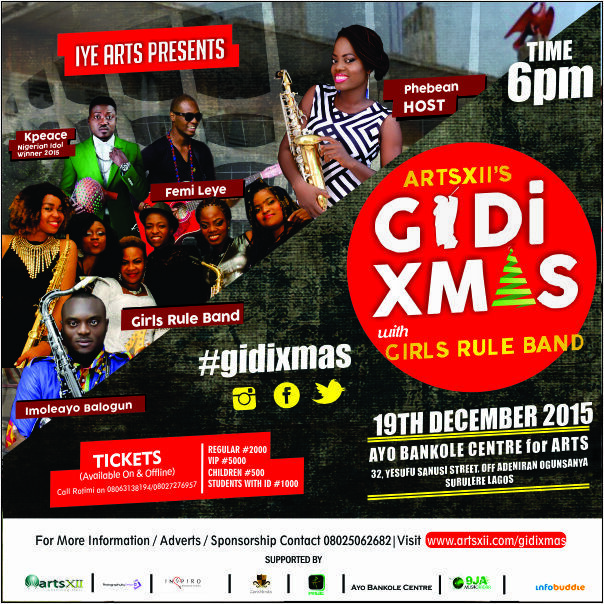 Gidi Xmas is a project by IYE Arts and produced by female saxophonist Phebean Tosin Oluwadare. Year 2015 marks the fourth edition of Phebean’s yearly Christmas concert. Past concerts include 12 Gifts of Xmas 2012 [Coral Reef Ikoyi]; Gifts of Xmas 2013 at [terra Kulture]; Band Aid Xmas edition [Muson Centre]; and now the train moves to Surulere to give Lagos mainland a unique musical experience. Venue: AYO BANKOLE CENTRE FOR ARTS. Tickets are available online, off-line and at the venue. 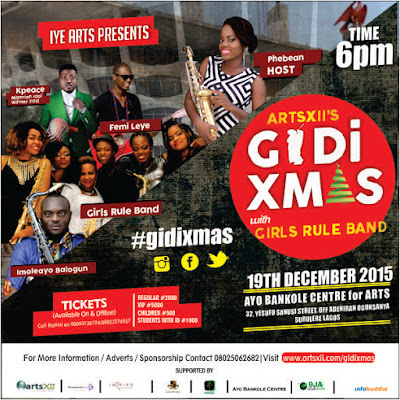 For more info please visit www.artsxii.com/gidixmas OR Call +234 806 313 8194, +234 802 727 6957, +234 802 553 1799.